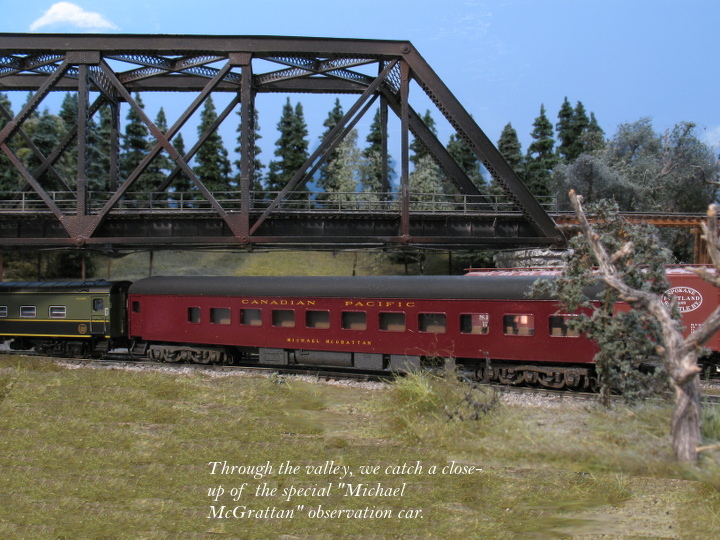 Today, Mike McGrattan Memorial Train crossed onto the NP's Prairie line. I got home from a short camping trip with my daughter to find a package waiting for me at the PO box. 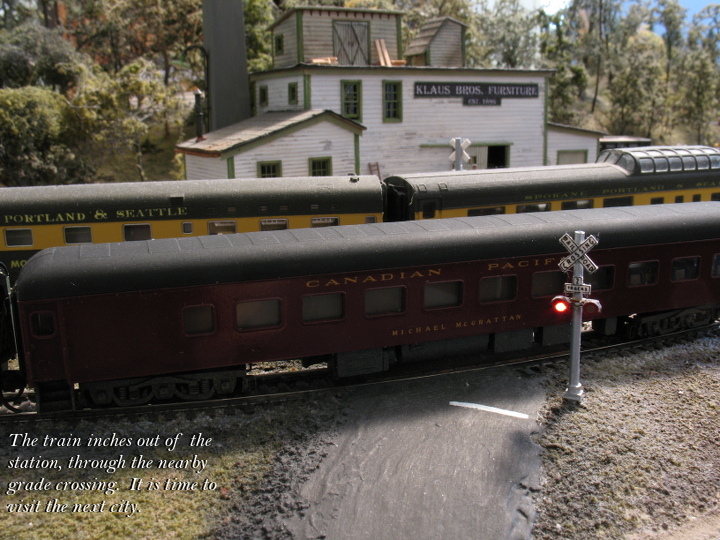 Once my daughter went to bed, I was able to spend some time running the Funeral Train, and reflecting. I apoligize for the poor picture quality, The software I use to stack Images isn't agreeing with Windows 10, so I was unable to fix the images. 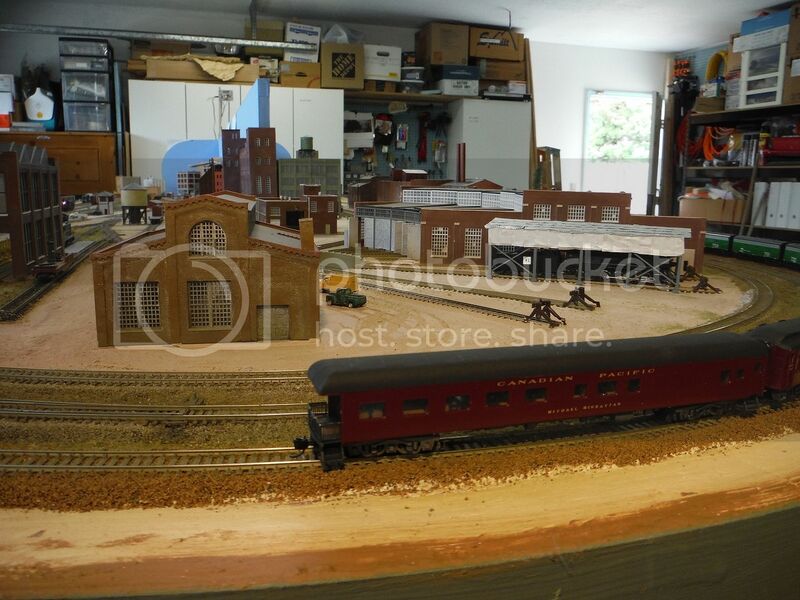 First shot is at Siding 1, where the former Tenino Junction station use to sit, Mike McGratton Memorial Train special passes though, as this train has the distinction of being the last train on my layout, (as it is being dismantled, so I can rent the room out to a friend,) the special has the rails to it's self. Next shot is at Siding 2, along the Deschutes River, Shot is taken from a vantage point on top of a nearby hill. Finally, Here is a short video of Mike's Memorial Train Passing the only pieces of Canadian equipment on the property, as tribute. RIP Puddy, you're greatly missed. 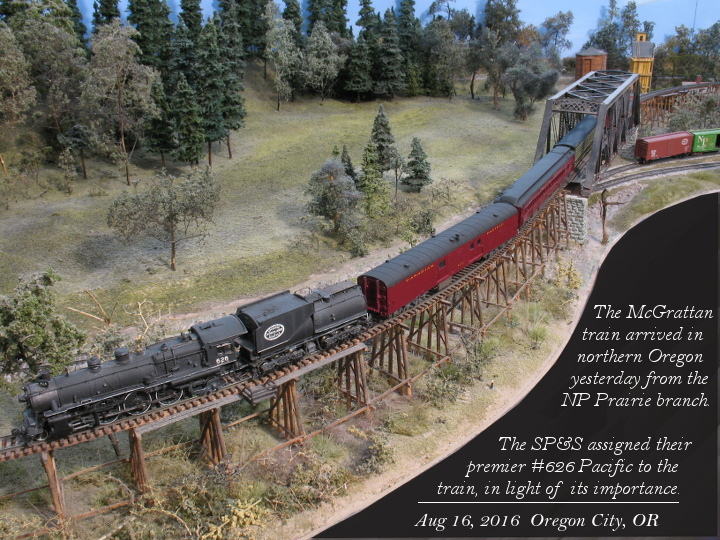 The McGrattan Memorial Train arrived in northern Oregon yesterday, handed off from the NP at Portland. 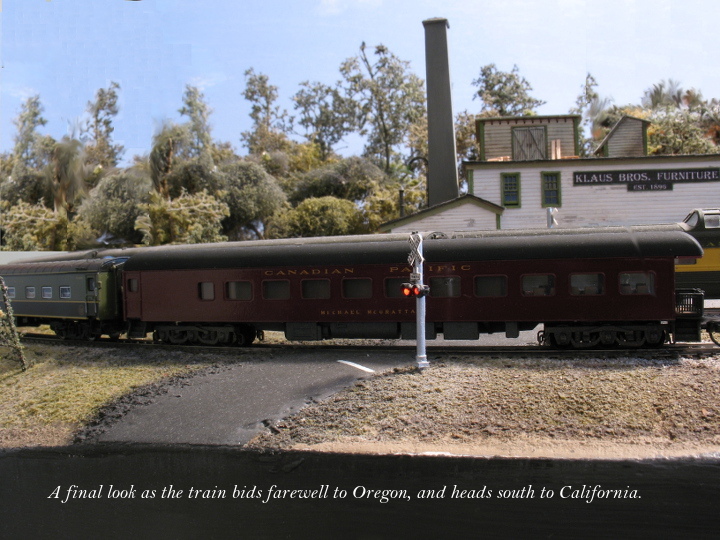 The SP&S took the train out into the rural Oregon countryside. 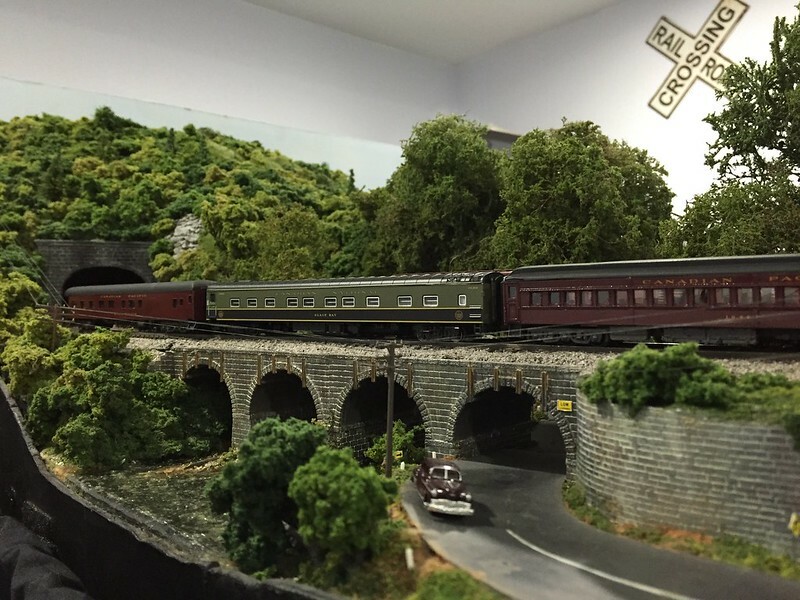 The Puddington memorial train arrived at Penn Station River City in the California Bay Area today. 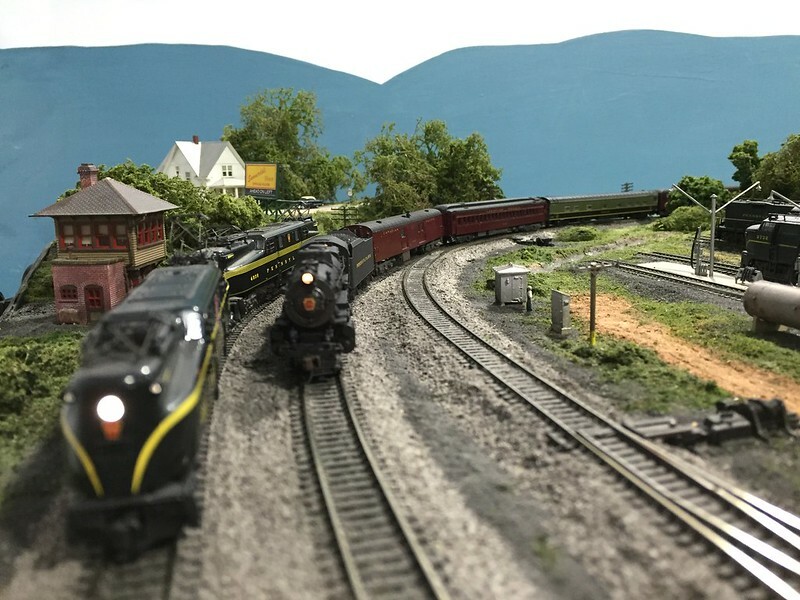 Quite an assortment of Pennsylvania Railroad trains, both passenger and freight assembled to give a proper send-off when it was finally time for the train to pull out. 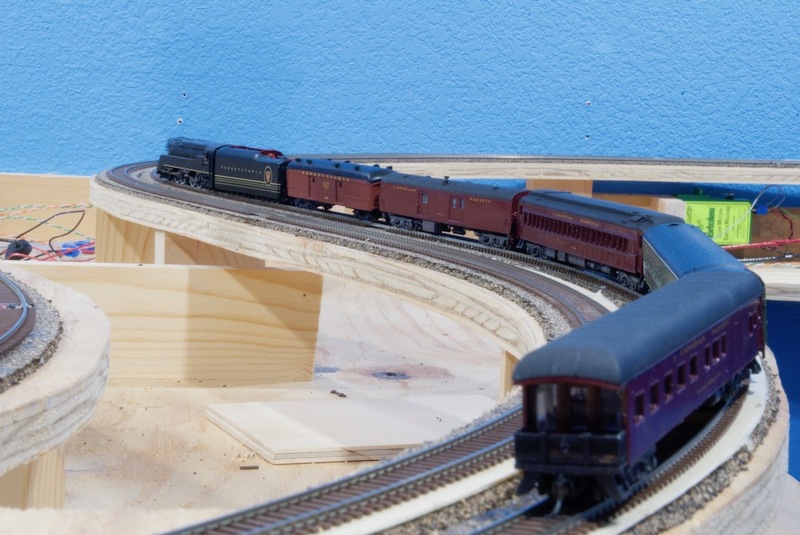 From left to right, a Q2 heading up a coal drag, an M1a with a mixed freight, a T1 with the eastbound Pennsylvania Limited, a K4 with the memorial train, a GG1 at the head of the California Limited, a K4 in special paint with the PRR executive train, and an E6 with a local. 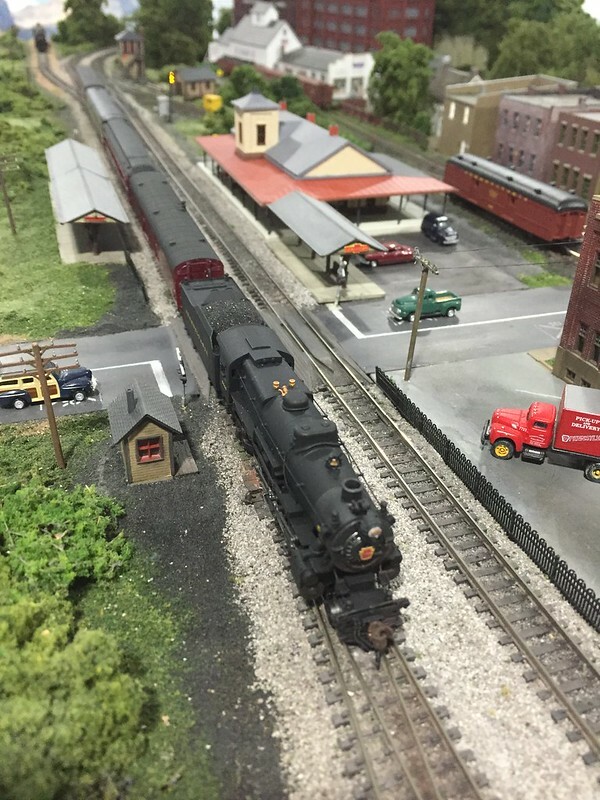 Each locomotive in attendance gave a blast as the memorial train pulled out. 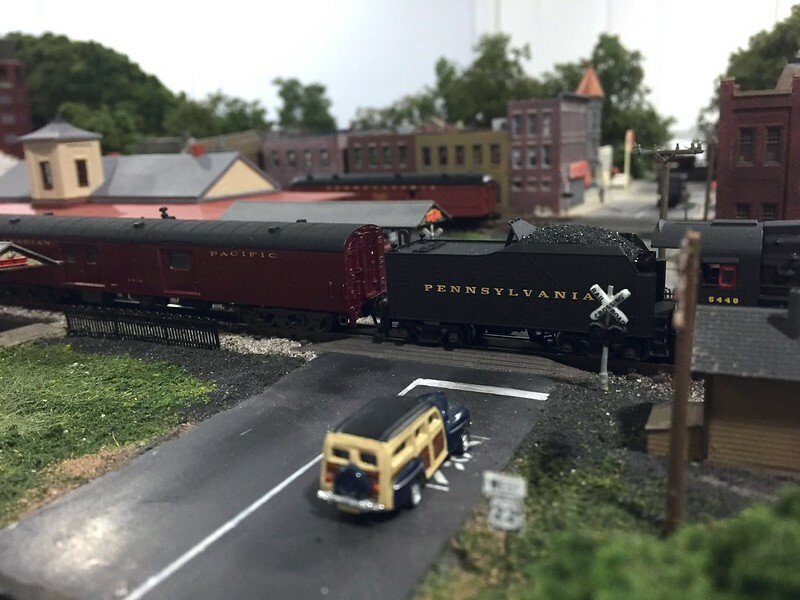 Traveling east, the memorial train passed the westbound Pennsylvania Limited. 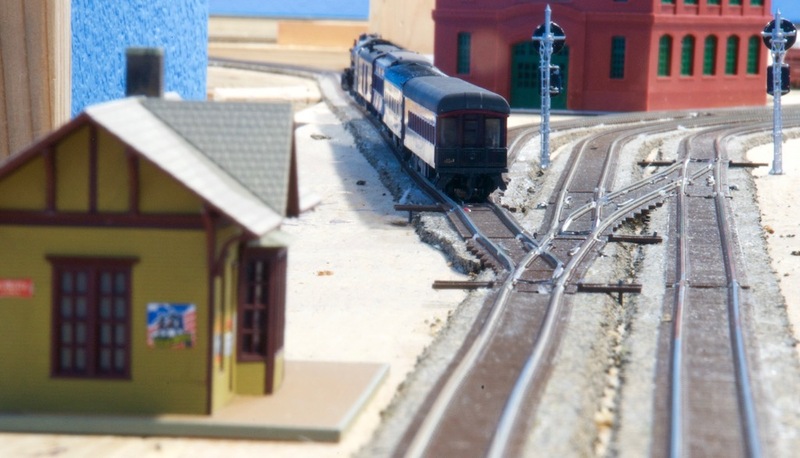 Upon reaching the East Bay town of Walnut Hill, the memorial train crossed over and headed into a siding. 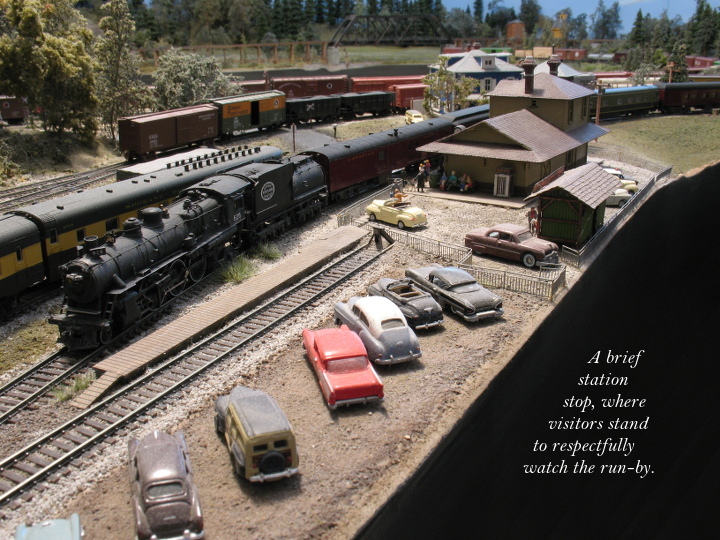 Here, the train parked for the night. 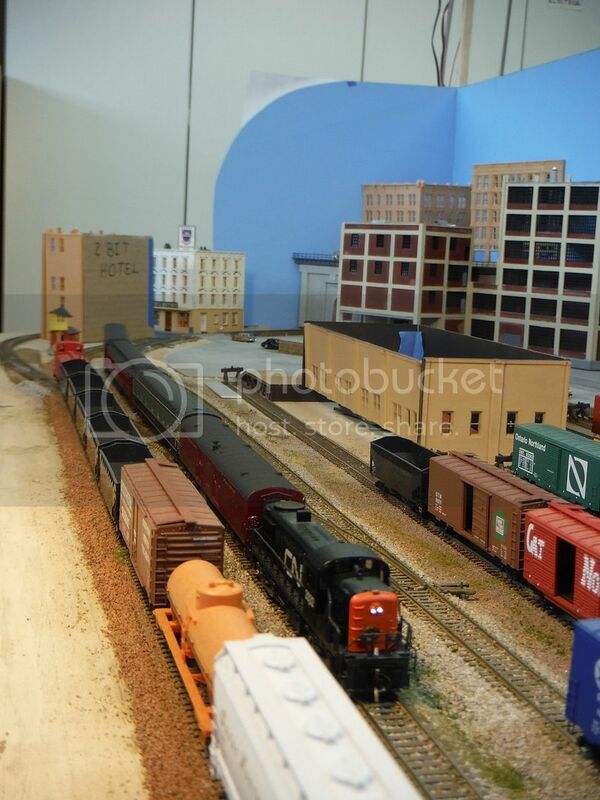 The baggage car was opened for viewing of the exhibits inside. 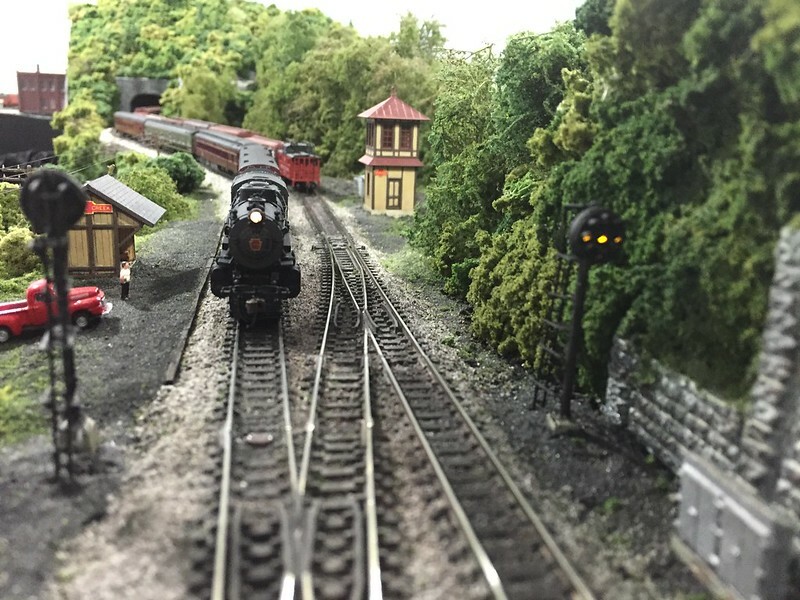 After a day at Walnut Hill, the train continued east. At Sacramento, power was swapped out for at T1 for the assault on the Sierras, the run across Nevada and Utah, and the climb up the Rockies. 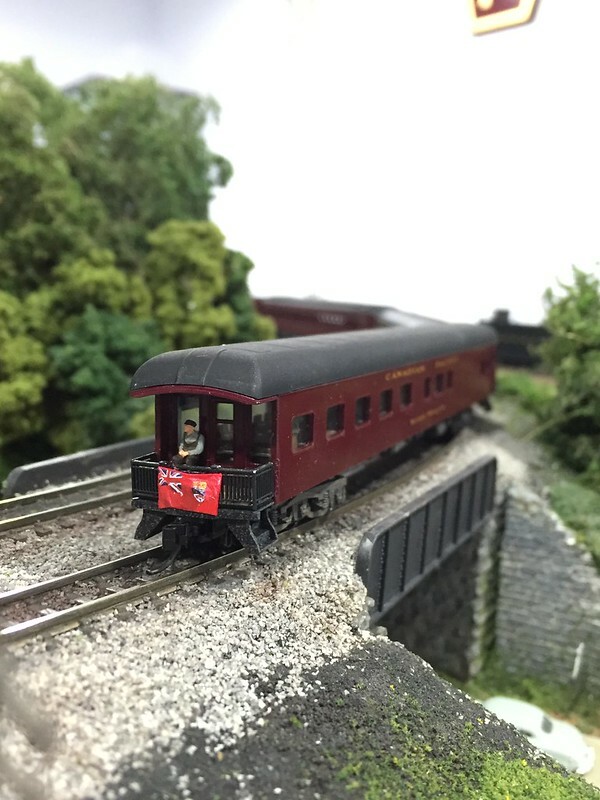 A baggage car was also added to hold additional supplies for the trip. 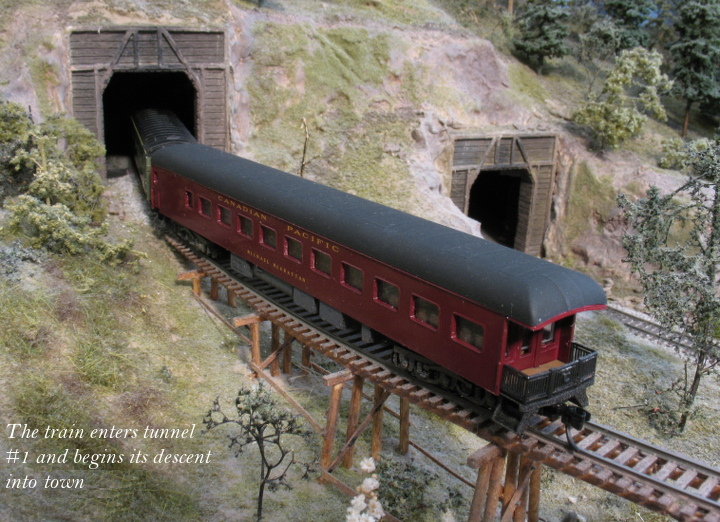 Here, the train climbs the grade through Red Canyon in Colorado. 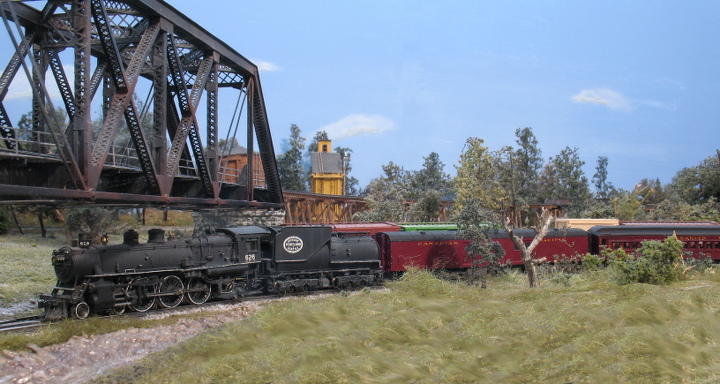 After the climb up the west slope of the Rockies, the train took a siding at Keystone, where the PRR has almost finished construction on a modern ski resort. The train drifted down grade toward Golden and Denver. Of course, it made a stop in Idaho Springs at a favorite ::ahem:: dignitary watering hole. 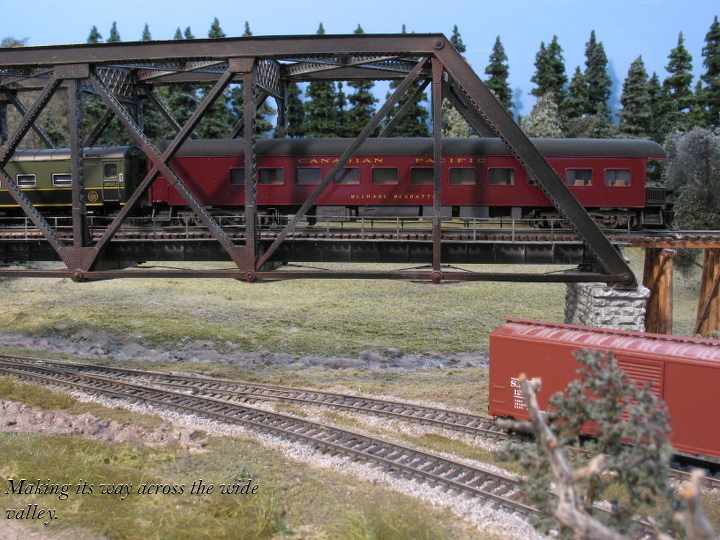 Although one of the mains was blocked, a local was able to pass on the opposite track. 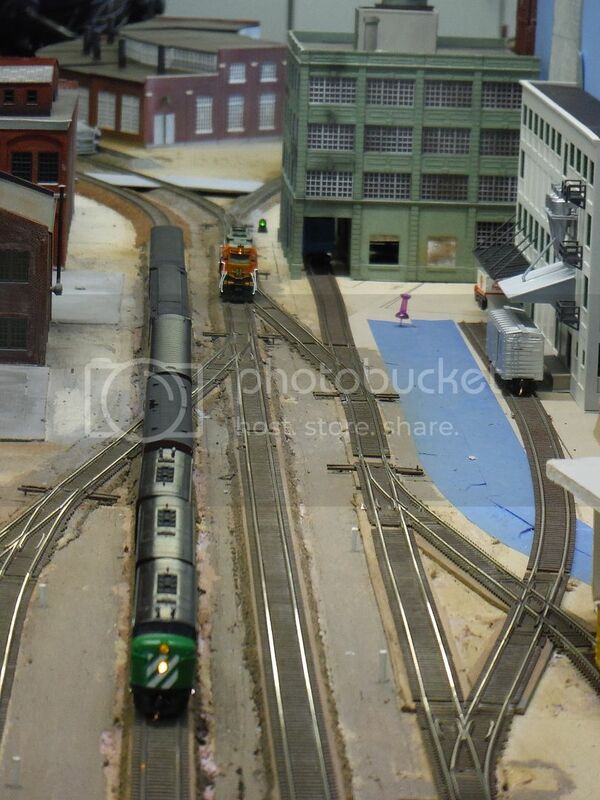 Finally, the train made its way to the Cascade Mountain, Mine & Mill Division and points beyond. As I wait for Mike's Memorial Train to arrive at my railroad this weekend I am reminded of the RFK funeral train in June of 1968 from New York to Washington. An estimated 2 million people lined the route to see the train. Perhaps Penn Central's finest moment. 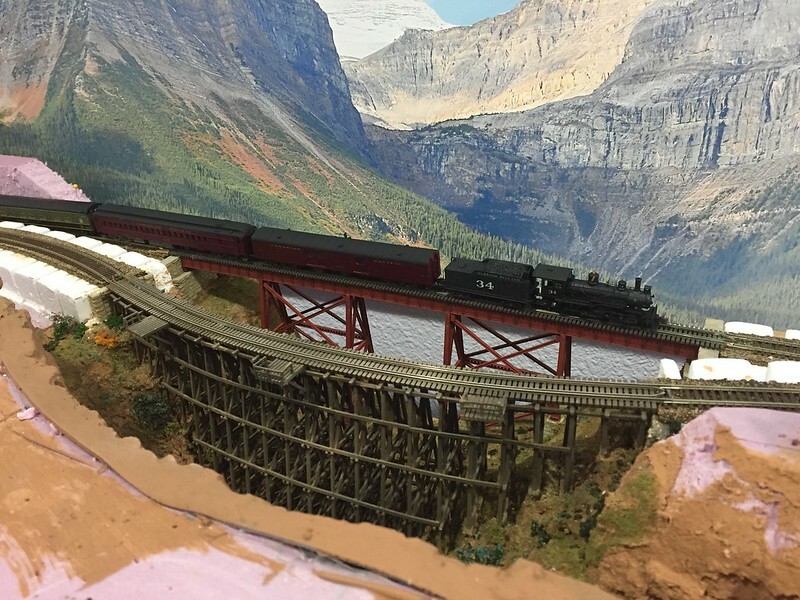 The Mike McGratten Memorial train arrived from the Transcontinental PRR via and exchange route into the Cascade Mountain Mine and Mill Division. 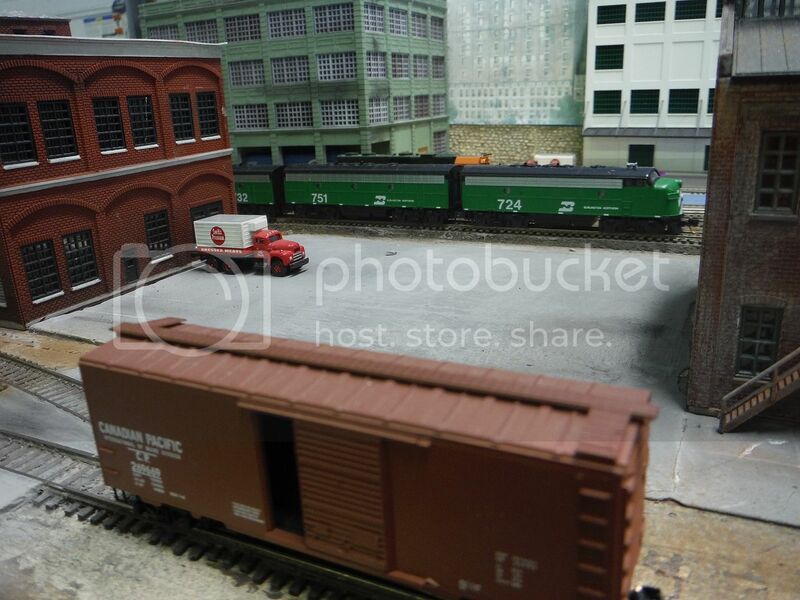 Ushered in by a CN RS3 the train arrives in the yard of Cascade. 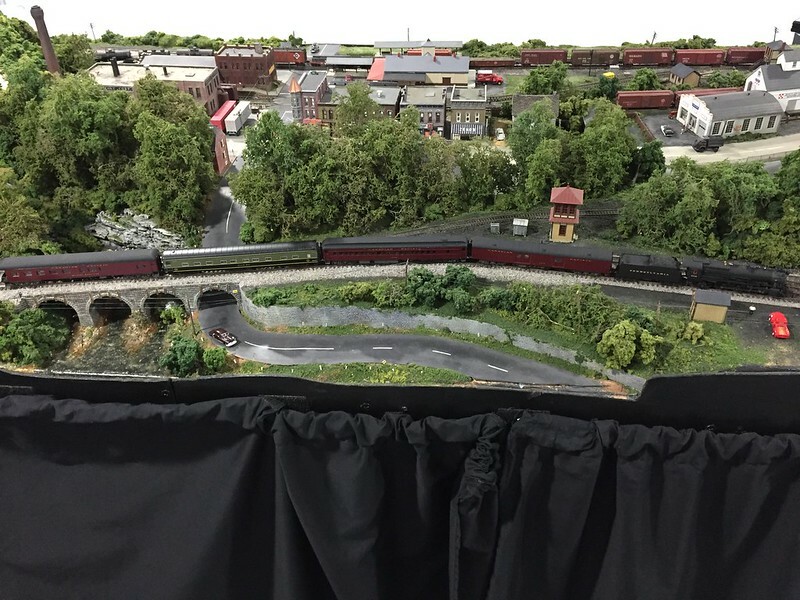 The Mike McGrattan Memorial Train arrived at the PRR Middle Division in central Pennsylvania and passed through Huntingdon (AKA Mill Valley, California). 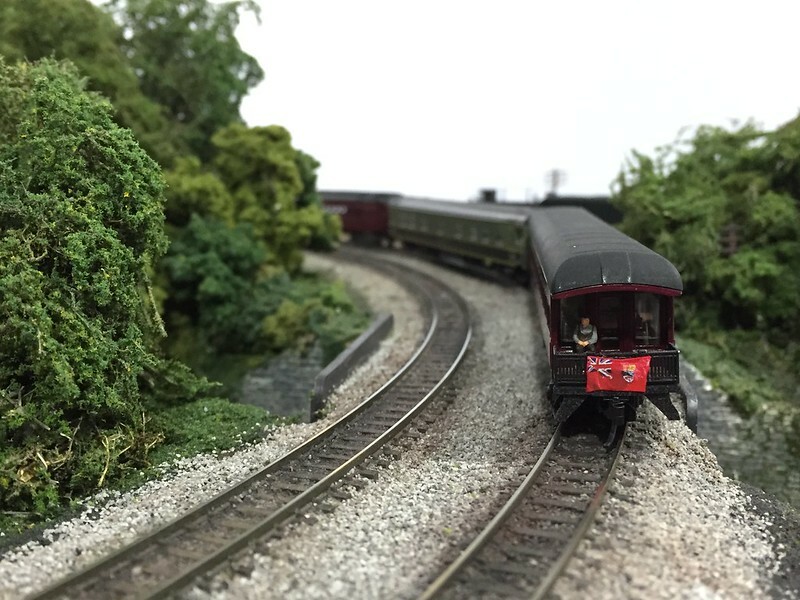 The business car was draped with Canadian flags to honor Mike (its the 1950s on this layout). 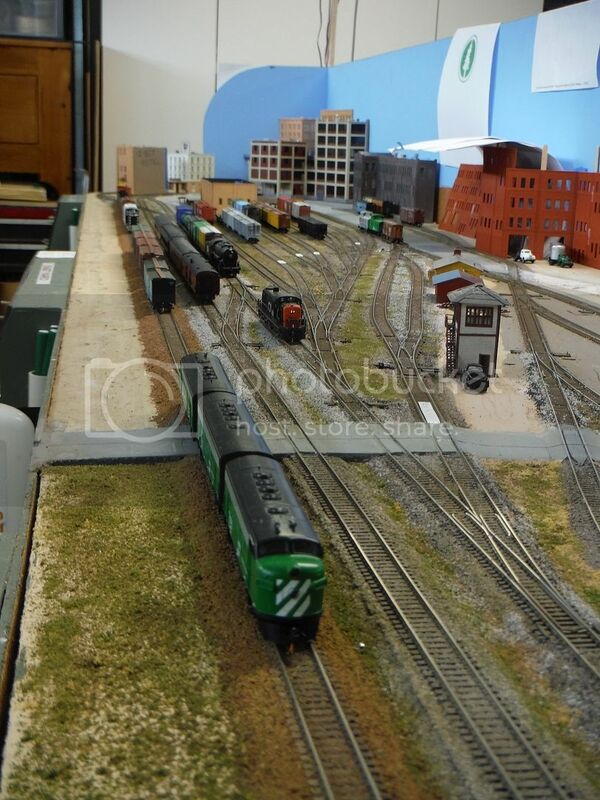 I see the train has gotten a blackened rear coupler pin and an observer on the rear platform. Nice touch with the flags; they should stay on the car. 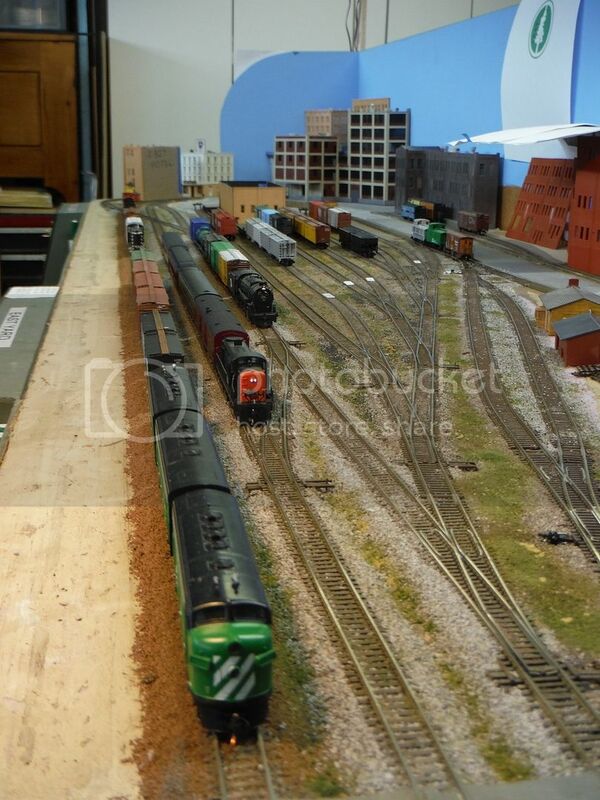 Be interesting to see if more little items are added as the train goes from layout to layout. I was tempted to put some people on the obs platform, myself. This is turning into a nice tribute. MR should mention it. - snip - Nice touch with the flags; they should stay on the car. 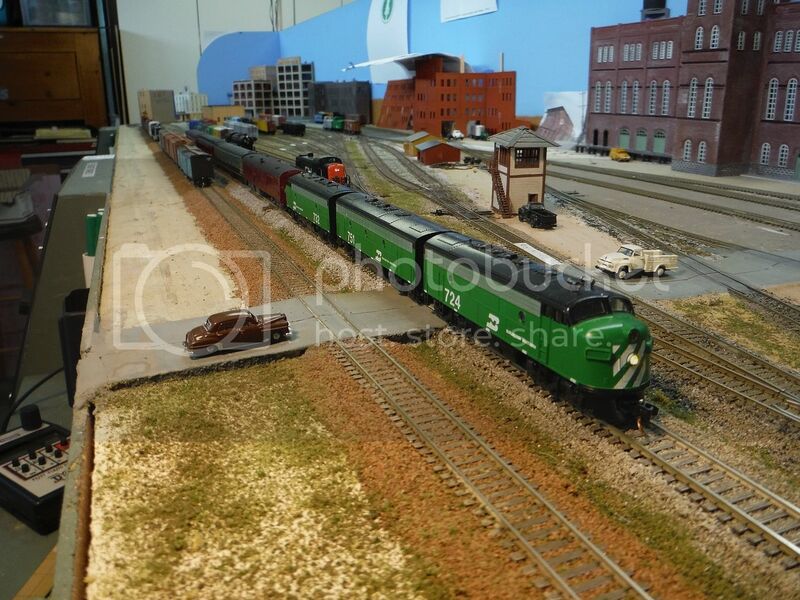 Be interesting to see if more little items are added as the train goes from layout to layout. I was tempted to put some people on the obs platform, myself. This is turning into a nice tribute. MR should mention it. Nice to see the flags. 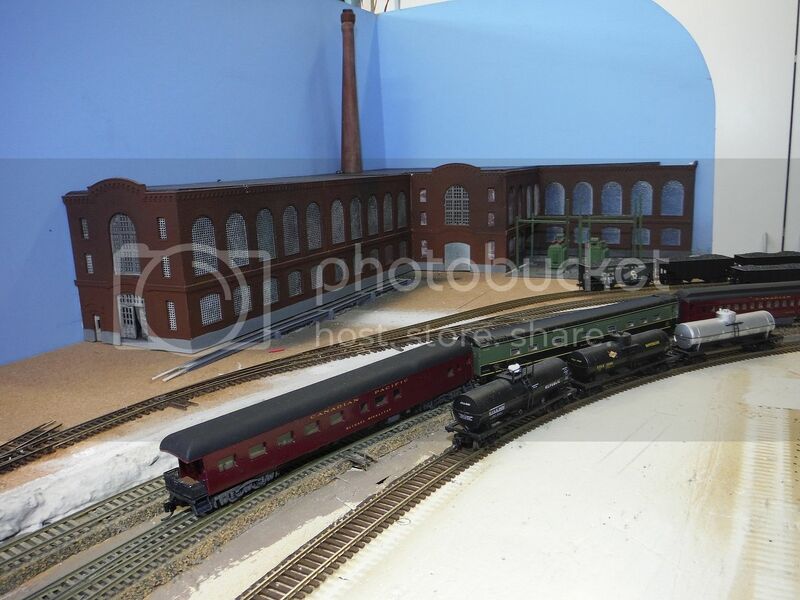 I am not sure when in the 1950s the PRR Middle Division is set but, as a Canadian, I would be remiss if I did not point out that those particular flags set the period of the photographs between 1957 - 1965. 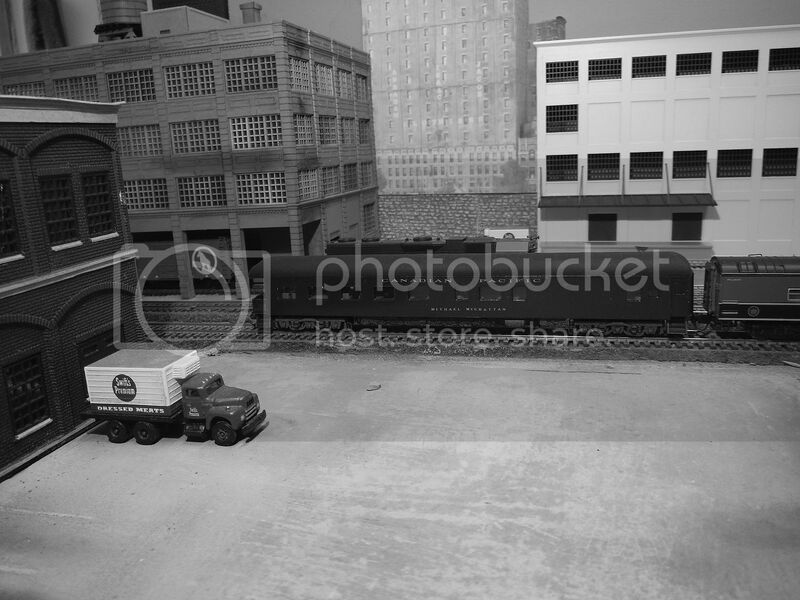 The majority of the automobiles appear to be from the early 1950s although the police car shown in the view at Huntington station looks as though it might be a '55 or '56 Ford - can't tell for sure from the photo. From 1922 - 1957, the Canadian Red Ensign had three conjoined green maple leaves in the lower field of the shield of the Canadian coat of arms. On 8 October 1957, those maple leaves were changed to the red shown in the photos and on 15 February 1965 we got the current red flag with a single red 11-point maple leaf on a centred white field which is half the width of the flag. 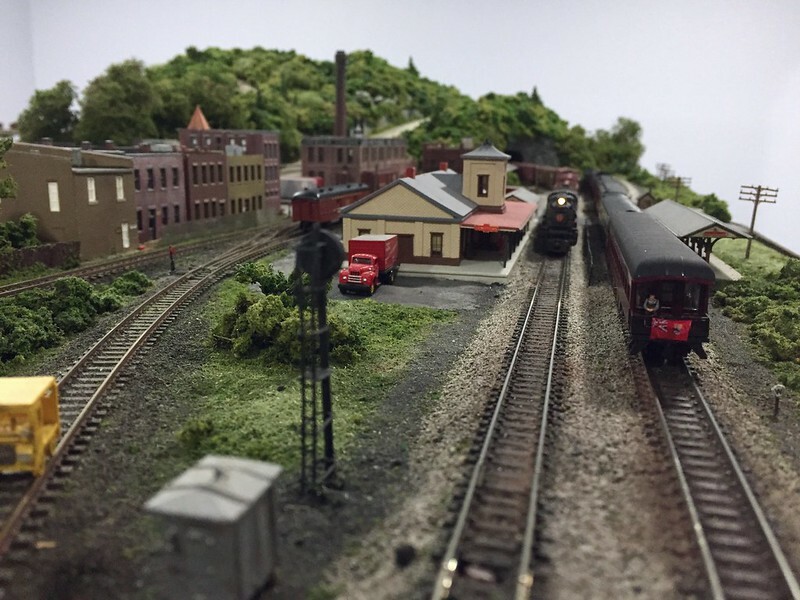 Very happy to see that the model railroading "time machine" is active, however. When the train comes to me, it will be September 1952. It will be arriving in Colorado Springs, Pennsylvania ( ) soon enough! 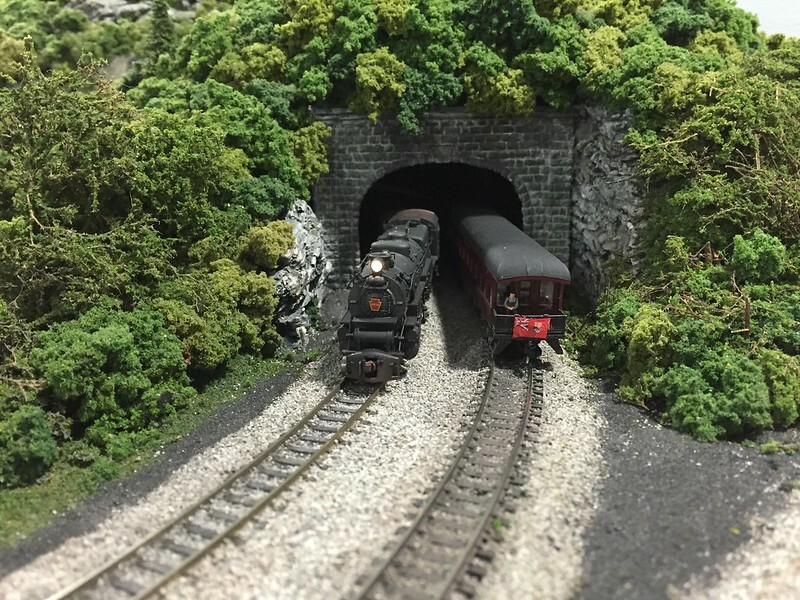 On my layout it's July of 1956. Thanks for the great photos and the video Doug. Your layout looks great. Not that I have any real authority to comment for or 'agin, but I think the addition of the flags on the 'Michael McGrattan' is a great idea, and a really appropriate touch for Mike's car. It was a bit of rush to get the cars ready for their trip, and I think Tim and I both wish we had time to add add some finishing details. Thanks for the comments. I thought Mike deserved some flags as a great Canadian. I included additional flags in the box (including the modern Canadian flag) if anyone else wants to use them. 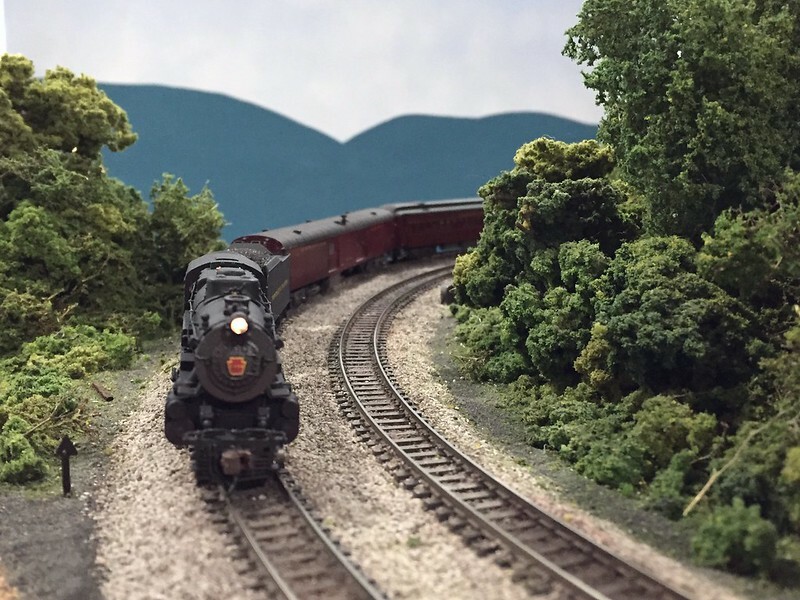 The Mike McGrattan Memorial Train visited the PRR Juniata Division in July, 1956. 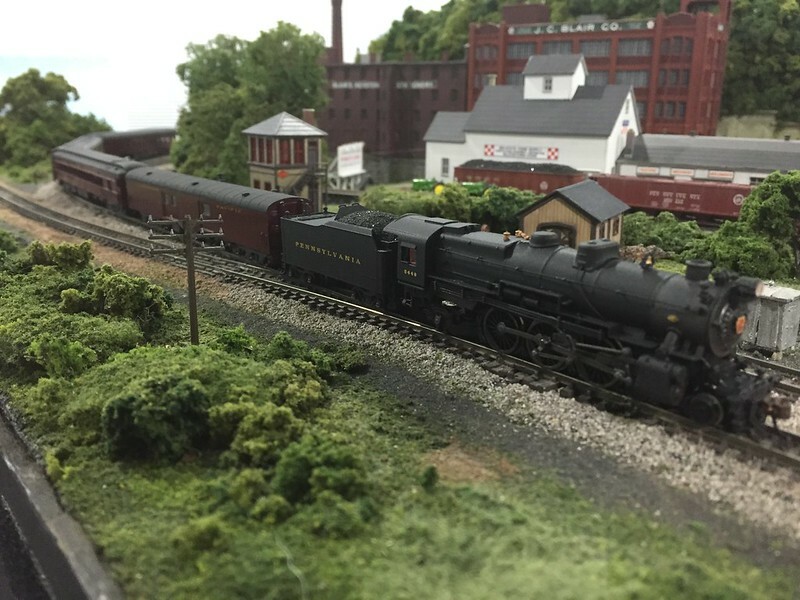 It was hauled by venerable K4s number 5448. 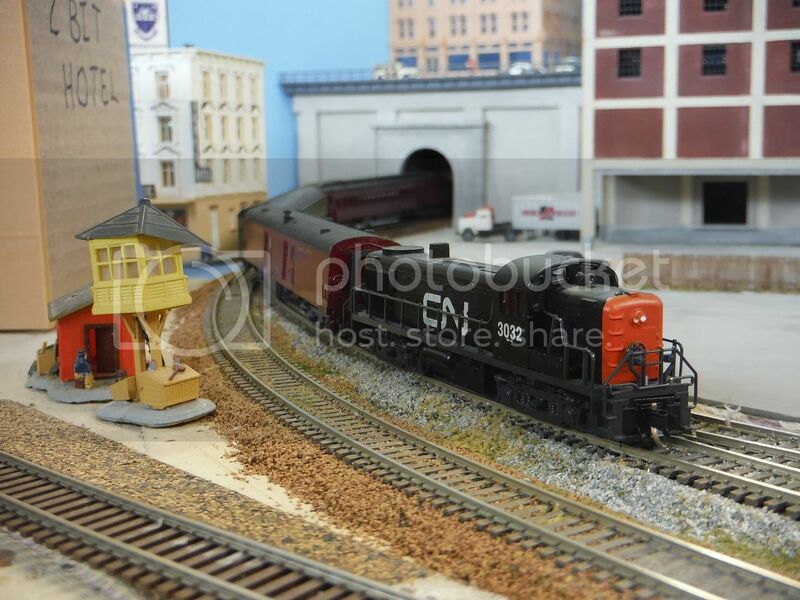 The train arrived in Enola where it will switch power to a pair of GG1s that will take it across the Susquehanna by way of Shocks Mills Bridge.